Picture this: you’re sailing the salty oceans with your scurvy mates when, suddenly, a skull appears in the clouds above, serving as beacon toward a fortress full of undead guarding the key to unlock untold fortune. But you’re not the only ones who can see the signal, and rival pirates all over the seas turn to meet the challenge at once. Check out all the details on Sea of Thieves’ quests, guilds, and more. 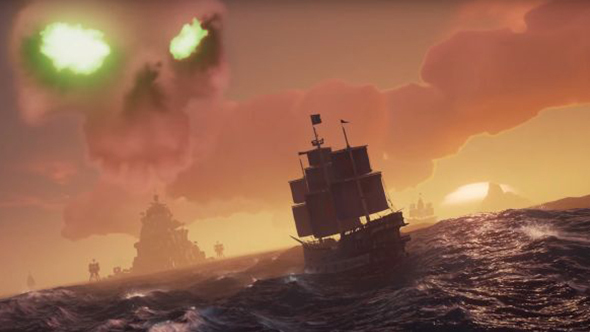 That’s the idea behind Sea of Thieves’ Skeleton Forts, which are seen across the map but only become active on certain occasions, naturally drawing player crews toward them with a highly-visible skull cloud. You fight waves of skeleton guardians on the beaches and in the forts, culminating in a battle against a much tougher captain. Once the captain’s defeated, the cloud dissipates and he drops a key that opens a vault filled with treasure – more treasure than a single crew can haul off at once. That means you’ll be forced to either defend your haul, make alliances and divvy up the rewards with other crews, or just run and grab what you can. Rare are putting together a compelling pile of piratical adventures for Sea of Thieves, and all that’s left is to wait for the game to sail into harbour and see how it all holds up.